As residents of Benghazi, Libya, marked the anniversary of Libya’s revolution on Feb. 19, the head of the city’s diminished Catholic community spoke of a need to rebuild his congregation and of the uncertainties ahead. “Thank God everything passed peacefully,” said Bishop Sylvester Magro after a Mass attended by just a few dozen worshipers, most of them Filipinos. Beyond the gates of the Church of the Immaculate Conception, the city’s Mediterranean-facing boulevards were crammed with thousands of revelers, guarded by heavily armed militia and a fledgling black-clad police force. Libya is an almost entirely Muslim country, with Christianity restricted to enclaves of foreign workers. Benghazi was once home to a 2,000-strong Catholic community. Now just 300 Catholics remain. Despite the official end to the war in late October and the return of relative security in eastern Libya, Bishop Magro said Catholic migrants are only slowly returning. 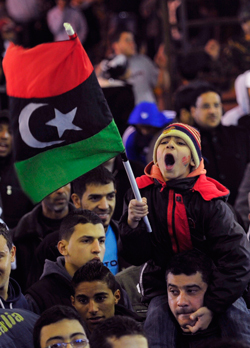 The prospect of a new, more Islamic government for Libya has raised some concerns over future restrictions on the country’s Christian communities. This article also appeared in print, under the headline "Rebuilding Libya," in the March 12, 2012 issue.